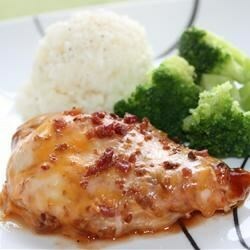 "Chicken breasts baked with barbecue sauce, mustard, bacon and cheese. Hot, meaty, cheesy chicken." Melt butter or margarine in a large skillet over medium high heat. Add chicken breasts and saute until just cooked; don't brown. Place chicken on a lined cookie sheet. Spread a little barbecue sauce, then a little mustard, evenly on top of each breast. Arrange a bacon slice on each breast, then cover all with cheese. Bake at 350 degrees F (175 degrees C) for 30 minutes or until chicken is cooked through and juices run clear. I think it tasted great. I didn't fry it before I baked it and it turned out just fine.